Watch this video to see what causes attic mold & how Dr. Energy Saver prevents and solves the problem! Dr. Energy Saver can air seal the attic and upgrade insulation to stop moisture from escaping your living space and leaking into your attic. Our improvements can stop attic mold and improve the overall comfort and energy efficiency of your home! Molds belong to a vast family of fungi that can grow just about anywhere if moisture, oxygen, and cellulose (or other organic material) are present. Because mold reproduces by microscopic spores that travel in the air, it can easily find its way into the attic through roof vents, air leaks in the attic floor and larger openings like attic hatchways or drop-down stairs. Airborne mold spores cause a wide range of respiratory ailments and allergic reactions. When mold is found in the attic, the main concern is usually damage from rot and excess moisture. The type of mold you find is generally not important, because the real issue is how to stop mold from spreading and causing more severe damage. Mold from a ventilation mistake. The black stain on the roof sheathing is a mold infestation. 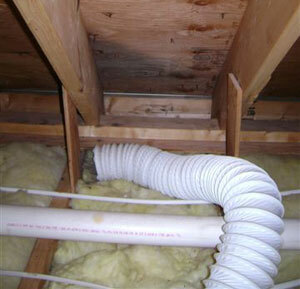 It's caused by a dryer vent that blows moist air into the attic instead of ducting this air to the outside. Attic mold is more prevalent in colder climates than in warm climates. To understand how an attic mold infestation can start, let's look at some common ventilation errors. In many houses, a bathroom vent fan is allowed to dump moist bathroom air into the attic space rather than ducting this air to the outside. So when someone turns on the bathroom fan while taking a hot shower on a cold morning, a large volume of warm, moist air is blown into the attic space. When the warm, moist air hits cold roof sheathing in the attic, most of the moisture condenses out of the bathroom air. Water wets the roof sheathing, drips down the rafters and saturates attic insulation. Wet wood in a dark space is an ideal environment for mold to take hold. Warm, moist air that makes its way into a cool attic causes more than attic mold problems. In many houses, it's also a sign that too much conditioned air is leaking into the attic, compromising comfort and causing the HVAC system to consume more energy than necessary. Warm, moist air from the living space doesn't need a fan to migrate up into the attic. It can get there through air leaks -- around recessed light fixtures, through gaps around heating vents, through air leaks around an attic access hatch, and through numerous other cracks and leaks. Mold can form in the attic from this "passive" air leakage alone. To reduce the amount of air that leaks into the attic from the living space below, our energy technicians can air seal the attic and make sure that vent fans and dryer vents are ducted to the outside. We will also make sure that the attic roof is properly ventilated with the right combination of soffit, ridge and gable-mounted vents. These improvements are usually enough to stop attic mold growth and moisture damage. There's an important additional benefit to having this work done: Air-sealing the attic and having the attic properly insulated can cut heating and cooling costs by as much as 40%. If you'd like to enact these savings in your home, call your local Dr. Energy Saver dealer or contact us online! We provide our proven attic insulation services across the country.